iTunes is responsible for introducing podcasting to thousands of new listeners every week, and its significance to digital media is endless. As the premier distributor of digital content in the world, Apple has made podcast marketing a viable strategy in the hi-tech modern world, according to today’s DigitalMarketer.com article. Traditional television and radio commercials are expensive, intrusive and ultimately ineffective. The times have changed, and they’re pointing towards podcasts and other downloadable media as the future of marketing. 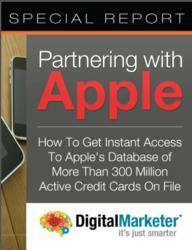 “Partnering with Apple: How to Get Instant Access to Apple’s Database of More Than 300 Million Active Credit Cards on File” is the newest Special Report from the Digital Marketing Labs. It shows any entrepreneur or independently-owned business how to upload podcasts, e-books, mp3s, or videos and make them available to iTunes’ media-hungry crowds. Not only that, but it serves as a guide through the world of digital content marketing, the article explained. “Partnering with Apple” makes businesses wise to the ways actual advertising within that content can be effective. The findings of the Podcast Consumer Attitudes study, which was conducted in 2010 by the Association for Downloadable Media along with Edison Research, are in marketers’ favor. The study concluded that 37% of respondents expressed positive sentiment about advertising in podcasts, as opposed to only 6% who responded similarly for advertising methods in television and radio. The DigitalMarketer.com article said that any entrepreneur with the tools and motivation to submit an e-book or publish a podcast on Apple is at a major advantage. If it’s unclear how to make a compelling podcast and still be able to turn a profit, the “Partnering with Apple” Special Report will show how the quality of content matters first, and subtle advertising opportunities will naturally reveal themselves. The “Partnering with Apple” Special Report puts it simply: iTunes is an essential part of a podcast’s promotional strategy, giving it syndication and exposure that it couldn’t get from any other directory. iTunes is responsible for introducing podcasting to thousands of new listeners every week, and its significance to digital media is endless. The Digital Marketing Labs are devoted to providing useable advice and strategies based on rigorous research and analysis for marketers looking to innovate and expand beyond the traditional forms of advertisement. They release Special Reports like this one to their subscribers and supply them with the information they need to create successful marketing campaigns. Anyone can learn how to share their digital content with the hundreds of millions of eyes, ears, and wallets accessible through Apple. For the most comprehensive information on podcast marketing, a copy of “Partnering with Apple” is available today.